The Fremantle Chamber Orchestra will be performing in the Fremantle Townhall this Saturday at 3pm, so not on the usual Sunday, due to the Blessing of the Fleet. The great Mark Coughlan will be conducting with as soloists Rebecca Glorie on violin, Louise McKay on cello and Anna Steptsova on piano. On the musical menu are Beethoven, Rossini and Schubert. I have already read some raving reviews about yesterday’s Perth concert, so don’t mis the Fremantle Chamber Orchestra concert with pianist Heidemarie Wiesner at the Freo Townhall TODAY at 3pm! SOUL-WARMING WINTER CONCERT AT FREO TOWNHALL TODAY! It is wet and stormy out there in beautiful Freo, so a perfect day to go to the Fremantle Chamber Orchestra concert in the Townhall at 3pm today. Delight in the gorgeous classical music of Boccherini, Mozart, Beethoven and Haydn. Comments Off on SOUL-WARMING WINTER CONCERT AT FREO TOWNHALL TODAY! Early warning for the next FREMANTLE CHAMBER ORCHESTRA concert in Freo on Sunday November 12. Please note that due to the Kings Square project the concert will be held in B Shed on Victoria Quay! Come listen to Haydn, Handel and Mozart at 3pm. Tickets at door. FREMANTLE CHAMBER ORCHESTRA CONCERTS THIS WEEKEND! Young violinist Emily Leung will be playing with the Fremantle Chamber Orchestra at the Fremantle Townhall tomorrow Sunday July 23 at 3 pm. Beethoven, Bruch and Mendelssohn are on the program so it should be a beautiful afternoon of great classical music. If you can’t make it tomorrow, or want to listen to the concert twice, they are also performing today at 3 pm at the Perth Town Hall. Comments Off on FREMANTLE CHAMBER ORCHESTRA CONCERTS THIS WEEKEND! FREMANTLE CHAMBER ORCHESTRA concerts on Sunday at the Fremantle Townhall and on Saturday at the Perth Townhall. Check the poster for details. 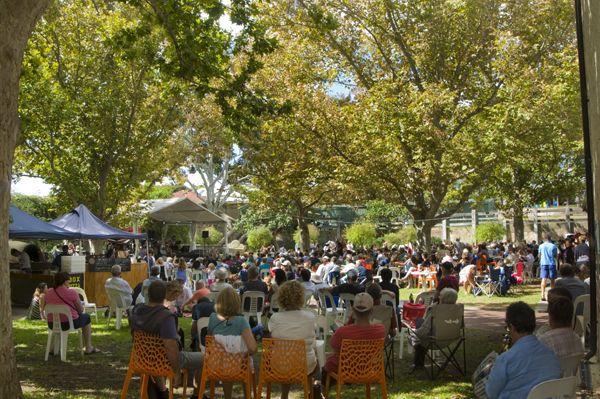 The last of the free Sunday summer concerts was held at the FREMANTLE ARTS CENTRE this afternoon with an invigorating mix of African/Peruvian jazz. Close to 24,000 people attended the concerts this season and that is no doubt due to the very high standard of performers. The FAC crew deserves a pad on the back for that! There is one more, and a very different, free concert on Saturday April 11 when the FREMANTLE CHAMBER ORCHESTRA performs a huge variety of Opera, World Music and Classical. The special program is for everyone to enjoy with some of the most beautiful opera melodies by Mozart, Delibes, Puccini, Offenbach as well as Arturo Márquez’ Danzon 2 with its hot South American rhythms, percussion and catchy tunes, Piazzolla’s Verano Porteno infusing jazz and tango and Australian Richard Meale’s magic Cantilena Pacifica. There are also classical master pieces such as Beethoven’s 5th Symphony (1st and 4th movement), Mozart’s Don Giovanni Overture, and Verdi’s sublime Prelude to Traviata. It starts at 7pm and doors open at 6 pm, so take note and be there!